To facilitate the usability of PromoterCAD, we provide the tooltip informartion. Then it is easy for users to undergo the promoter motif manipulation. "Start your promoter design with the empty sequence in the region -32 to -10031 from the transcriptional start site." Then users can start their promoter design by clicking the button. To execute the synthetic promoter design using the PromoterCAD, please go through the following workflow basically. At first, with the menu "Select tool", users can select one of the functions for performing a particular data operation. For example, the function "MotifMaxExpress" finds motifs associated with maximum gene expression in a specific condition. Select this function to find motifs associated with strong expression in myeloid leukocyte samples. With the menu "Analysis Method", users can select a regulatory motif data set (PEDB) registered in LinkData. 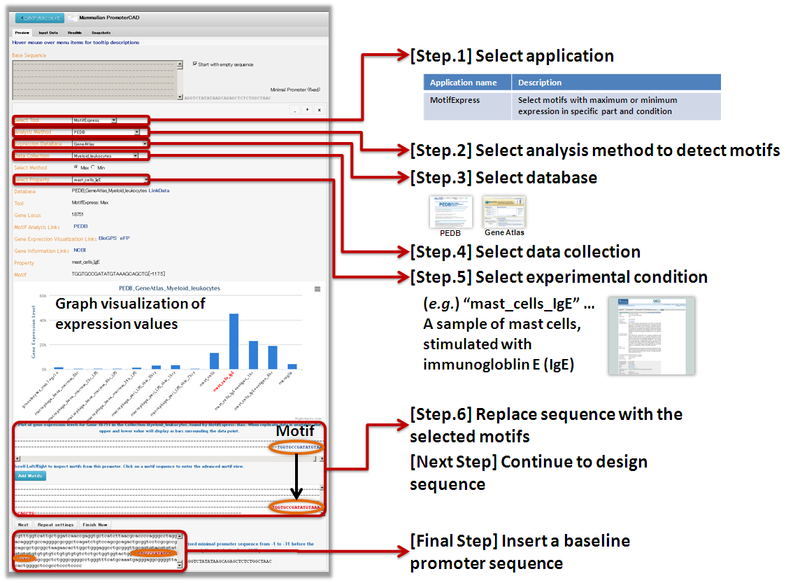 With the menu "Expression Database", users can select microarray expression database (Gene Atlas) registered in LinkData. Data containing the sample conditions of mouse cell resources from Gene Atlas has been split into a series of data tables by tissue organ and cell types. The next menu "Select Property", users can select one of the expression conditions associated with the database. For the Gene Atlas data, this is represented by a shorthand description. For example, "mast_cells_IgE" refers to a sample of mast cells, stimulated with immunogloblin E (IgE). The gene expression is for mast cells. Select a particular experiment and MotifExpress will find known sequence motifs associated with high expression in this condition. MotifMaxExpress will automatically display these motif sequences (in this case septamers) in line with the base promoter sequence at the same location as they occur in the promoter returned by MotifExpress. By clicking the button "Add motif", all the selected motifs are incorporated into the promoter motif skelton. The result will be displayed in the text area with the motifs indicated by color. In the final step, click the button "Finish Now" to fill in the skeleton (the 'bones' of the promoter, containing just regulatory motifs and the minimal promoter region) with the remaining sequence. This will replace the blank '-' sequences, but will preserve any motifs added in the design process. Here are tutorials to execute synthetic promoter designs using PromoterCAD. These have example walk throughs with snapshots for each step. Beginning_Tutorials_1 This tutorial illustrates how to design a synthetic promoter for Leaf specific expression using the MotifExpress tool. Beginning_Tutorials_2 This tutorial illustrates how to design a synthetic promoter for Circadian expression with MotifCircadian tool. Beginning_Tutorials_3 This tutorial illustrates how to use InputMotif tool to add specific motifs to a gene design. Advanced_Tutorials_1 This tutorial illustrates how to fork your own PromoterCAD workspace. Advanced_Tutorials_2A This tutorial illustrates how to add a new normalized data to PromoterCAD. Advanced_Tutorials_2B This tutorial illustrates how to add a new database PLACE motif data to PromoterCAD. Advanced_Tutorials_3A This tutorial illustrates how to add a new data mining plugin tool MotifRanking. Advanced_Tutorials_3B This tutorial illustrates how to add a new data mining plugin tool MotifNonCircadian. Advanced_Tutorials_4 This tutorial illustrates how to modify and upload your own tooltips. PromoterCAD source code is licensed under the LGPL-3.0 license (the GNU Lesser General Public License, version 3.0) and the Creative Commons license CC-BY-SA. So users can fork the source code of PromoterCAD to easily create their own data mining plugins. Please enter information for the application to be registered.